Hannibal Lecter loved them. Pythagoras hated them. Fava beans. Although siding with fictional serial killer characters isn’t really my thing, I’m with Dr. Lecter on this one. These beans are fantastic, rich and buttery. They can be served fresh and sauteed, are convenient when dried and even taste delicious in their canned form. I scored a few cups of dried fava at Whole Foods the other week and decided to make falafel out of them with great success. These are light and fluffy, and are perfectly crisp on the outside. Although these are traditionally served with a tahini dressing, I’ve paired it here with a sriracha-vegenaise sauce to give it a spicy-garlicky kick. Drain the water off of the fava beans (they should have a rubbery consistency and their tough leathery outer shells should be easy to remove.) Throw away any fava beans that have not softened. Discard the shells and transfer the small white beans to a food processor. Drain the chickpeas and add them to the food processor. Pulse a few times only. Add in the next eight ingredients and pulse until the ingredients have blended, but are still slightly coarse. Transfer the batter to a medium-sized bowl and refrigerate for at least four hours. In a small and deep saucepan, pour plenty of vegetable oil (enough to submerge the falafel in). Heat the oil over medium-high heat for 7-10 minutes. While you are waiting for the oil to heat up, roll the falafel into golf-ball sized pieces and set aside. Throw a pinch of the batter into the oil to test its readiness. If it sizzles immediately, you are ready to fry. Working in batches, slowly submerge the falafel into the oil and fry for about 3 minutes, or until the falafel is golden brown. (I use a skimmer, but a large heat-resistant spoon works well too.)TIP! Since the batter is cold, it is best to only fry a few at a time. Frying large batches will reduce the temperature of your oil and you’ll end up with a soggy mess. Immediately transfer the fried falafel onto paper towels to drain. The used oil may be cooled, strained and stored in the refrigerator and used a few more times before being discarded. Serve with the sriracha-vegenaise dressing or a tahini sauce. I love falafel, but every time I make it it turns out soggy. I think my problem might be making them in large batches, as you said. Thanks for the tip! you make the best look'n eats, Erin – they make me hungry and start cravings, too. so yum! oh yeah, and i mean to tell you, the sriracha-vegenaise combination = brilliant. i'm totally addicted. now i've gotta get my hands on some fava beans. w00t! 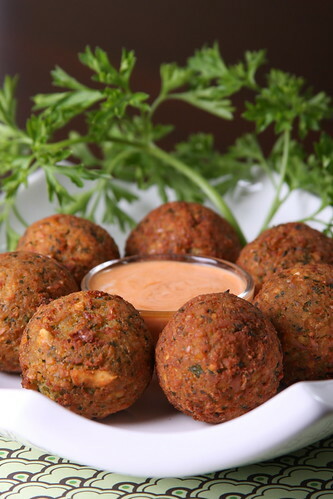 These falafels look super and perfect.. i am loving the spice! Thanks jessy! yep, I've started keeping a little container of pre-mixed sriracha-vegenaise in the fridge. It's so perfect with (most) everything! Awesome! Fava beans are very hard to find in my town and I don't get why. Maybe they are afraid of Hannibal. That's brilliant! I love the spiciness of falafels. Oh my word, I can't wait to try these. You had me at sriracha dipping sauce!!! Like your husband, I'm a meat and potatoes guy… but most of your food looks incredible and delectable. I've sent your website to several of my vegan (and non-vegan) friends this weekend after seeing your Indonesian Eggplant on Flickr… which I will be making this week. Great site! BTW, love the humor and history in this fava bean post! I always love to hear positive comments like this from meat eaters, and I'm thrilled you like the recipes! Thanks for sharing the site. I hope you enjoy the eggplant! i'm totally confused! (Sorry!). we dont' cook the dried beans first? To get the right texture, whatever beans you are using (chickpeas, fava-shelled) are only soaked, not cooked, which would result in mushy falafel. The high temperature of the fry oil cooks them enough while retaining their toothsome texture. i can't wait to try them though! I came upon your blog through the online reader's digest. I like it so far and will be visiting it often ! I have a question for you (might be silly but I am new to this…): What is sriracha?